Administrators at Taft Camp generously sponsored a graduation ceremony for a dozen studious prisoners and their families on June 4, 209. My friend, David Muniz, invited me to attend as his guest, and I felt grateful for the privilege, as I know how hard David worked to earn his high school equivalency certificate. I watched in admiration while David studied through textbooks to master subjects like English, math, science and history. He and his fellow graduates were deserving of this tribute the institution paid today. David is 29 years-old, and together with his wife, Gabriella, he works hard to build a better life for the couple’s two children, Brendon and Priscilla. Earning his GED represented but one step David is taking to demonstrate his commitment and love for his family. Since receiving his diploma, David has enrolled in courses at Taft Community College, and he has been working as an apprentice to develop mechanical skills repairing wheelchairs. Few young prisoners demonstrate such commitment to improving their lives. 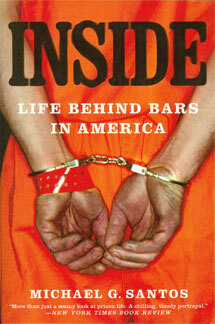 Being separated from family and community causes many prisoners to lose hope. When I asked David what motivated him to work so hard, he told me that the love he has for his wife and children requires him to work hard every day, as he feels a duty to live as a strong role model, even through these times of difficulty. When David returns to his family, he wants to ensure that he has every skill and credential possible that will help him overcome the stigma of his confinement. He intends on making meaningful contributions to his family and community, thus David expresses an urgency in using his time at Taft Camp to prepare. When I walked into the visiting room, the efforts that I saw staff had invested in making David’s graduation memorable amazed me. Speakers stood in the corner to broadcast music appropriate for the occasion; chairs were aligned neatly in rows that faced a lectern; typeset programs were printed to announce the order of ceremonies. David and his colleagues wore black gowns over their clothing, and each had the graduation cap complete with tassel. Then the graduation ceremony began, they marched in formed strides toward the honored seats at the front of the room. Then the chaplain from Taft Camp, Mr. Maurseth, stood at the lectern to bless the ceremony with a brief prayer. Mr. Ochoa, the Director of Education at Taft Camp, then toasted the graduates and introduced the ceremony’s keynote speaker, Dr. Jose Reyna. Dr. Reyna, who chairs the Department of Modern Languages and Literature at California State University, offered an enlightening history on the importance of education. He urged each graduate to continue the journey, as striving to develop our understanding of the world is a lifelong pursuit. When the professor concluded his remarks, Ms. Puentes, who presides over the Taft Camp as the Associate Warden, shook each graduate’s hand while simultaneously issuing their high school equivalency diploma. Later in the ceremony, a photographer snapped a picture of David and me together. 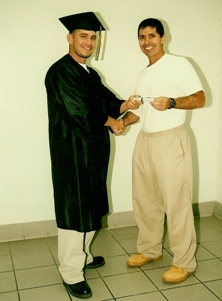 After all the prisoners received their diplomas, a reception followed. The staff ordered turkey and roast beef sandwiches from a local delicatessen. along with chips, cookies and two large graduation cakes – one chocolate and one vanilla. The effort administrators put into the graduation ceremony encouraged me as I know that such gestures go a long way toward inspiring prisoners to reach their highest potential. David Muniz may have to live separated from his family for a while longer. Though I share a cubicle with him and I’m certain he will continue hhis admirable efforts of preparing for a law-abiding, contributing life upon release, his family, he says, gives him all the motivation he needs.